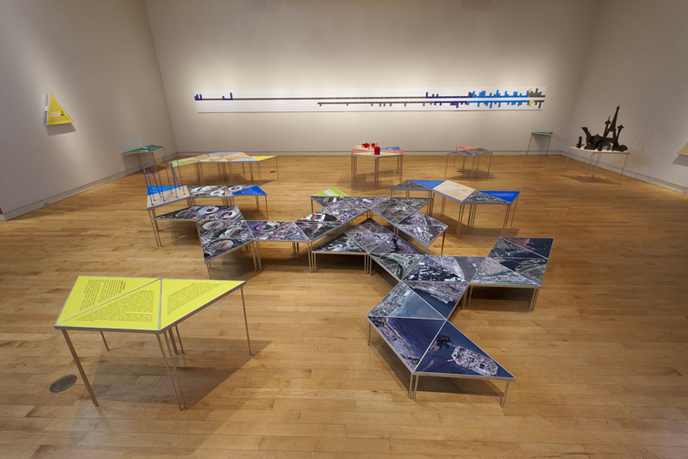 Global Cities, Model Worlds installation at the Miller Gallery, Carnegie Mellon University, 2011. Courtesy of the Miller Gallery. 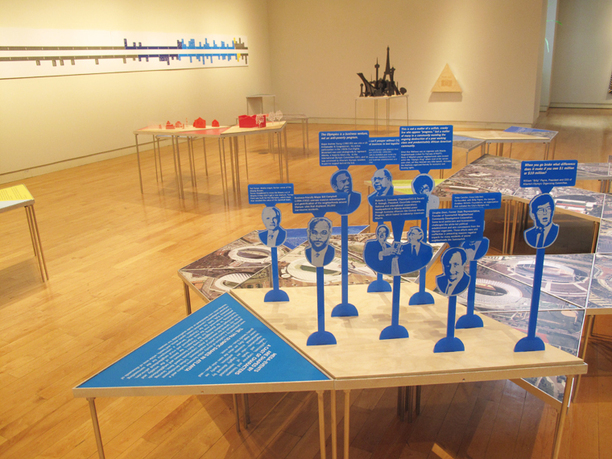 Global Cities, Model Worlds is a traveling exhibition about the spatial and social impacts of "mega-events," such as the Olympics and the World's Fairs. The host cities of mega-events seek to transform themselves through planning, architecture, and ideology, becoming "global cities" in the process. Locally, mega-events pave the way for redevelopment projects that can create new public resources such as parks or transportation, but often result in significant displacement of residents or industry, thus reinforcing existing social inequities. The exhibition contrasts the promise of transformation with the on-the-ground realities of urban development. GCMW's modular forms, made of interlocking equilateral triangles, were inspired by Buckminster Fuller's Biodome (built for Expo '67 in Montreal) and Dymaxion map projection. 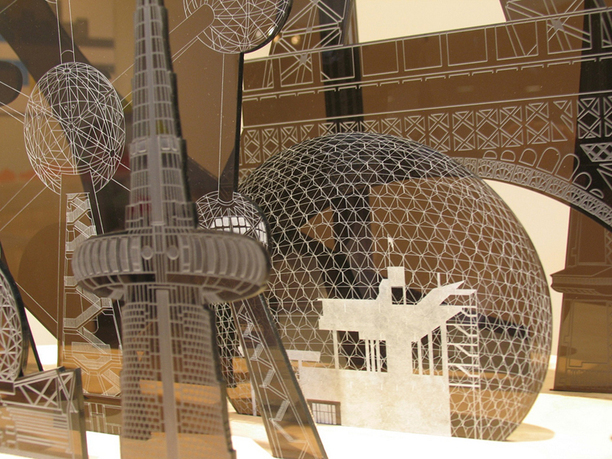 The exhibition contains aerial photos of every Olympic stadium and World's Fair site; a 40-foot timeline of mega-events in 2010; and pop-up acrylic models, which explore case studies of the impact of mega-events. GCMW will travel through the end of 2013 to cities that have bid for, hosted, or will host a mega-event. Ryan Griffis is an artist currently teaching new media art at the University of Illinois, Urbana-Champaign. His writing has appeared in publications such as the New Art Examiner, RePublic, ArtUS, Artlink, Rhizome, and Furtherfield. He has curated exhibitions for the School of the Art Institute of Chicago, Turbulence.org, Greenmuseum.org, and George Mason University on themes that include the politics of genetic technologies, energy consumption, and artistic forays into agriculture. Under the name Temporary Travel Office, Ryan creates work and publications that attempt to use tourism as an opportunity for critical public encounters. These encounters include public tours of urban parking lots, speculative proposals for parks and hotels, and most recently, a series of experimental guidebooks. These works have been presented in various institutional forums, including the Bureau for Open Culture (Columbus College of Art & Design), AREA Chicago, the Center for Land Use Interpretation, and Los Angeles Contemporary Exhibitions. Lize Mogel is an interdisciplinary artist who works at the interstices between art and cultural geography. She creates and disseminates counter-cartography—maps and mappings that produce new understandings of social and political issues. Her work connects the real history and collective imaginary about specific places to larger narratives of global economies. She has mapped public parks in Los Angeles, future territorial disputes in the Arctic, and wastewater economies in New York. She is coeditor of the book/map collection An Atlas of Radical Cartography and cocurator of the traveling exhibition An Atlas. Exhibitions include the Gwangju (South Korea) and Sharjah (U.A.E.) 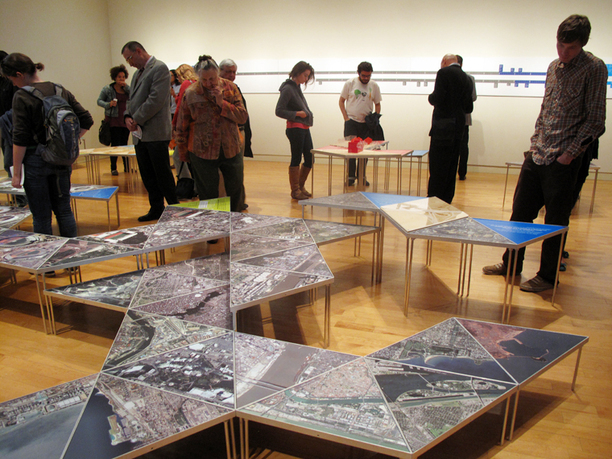 Biennials, PS 1 (New York), Casco (Utrecht), and Experimental Geography (touring). She has lectured about her work at numerous venues internationally. She has received grants from the Jerome Foundation, the Graham Foundation, the LEF Foundation, and the Danish Arts Council. Sarah Ross is an artist who works in sculpture, video, and photography. Her projects use narrative and the body to address spatial concerns as they relate to access, class, anxiety, and activism. Ross also works collaboratively with other artists on projects such as Compass Collaborators and Regional Relationships. She has cocurated exhibitions at SPACES Gallery, Cleveland; Sea and Space Explorations, Los Angeles; and PS122, New York. She teaches at the School of the Art Institute Chicago, and works with artists at an Illinois-state prison. Sarah is the recipient of grants from the Graham Foundation, the University of California Institute for Research in the Arts, and the Illinois Art Council. Her work has been exhibited in venues such as the Armory, Pasadena, CA; Gallery 727, Los Angeles; PS122, New York; Roots and Culture Gallery, Chicago; Pinkard Gallery, Baltimore; META Cultural Foundation, Romania; and the Canadian Center for Architecture, Montreal.